Forgive my lateness in this post. I started writing a month ago and didn’t get any pictures transferred over until the July 31st weekend. I thought I had set this up to publish already, but now I see it’s still a draft. Many things have happened, not many of them actually quilting related however, but there is a huge post waiting to be written about my experiences with my local guild! This post is not it (yet). And now a massive, fun, quilt trip to write about. Any event, here is quilt “news” from me frome early July. My quilts are finally “going, going … gone” from their Work in progress status! Thanks to my days at the retreat center, I finished the birds of the air quilt blocks, sent 40 off for the swap, keeping 8. I will get back 39 of the blocks since one is a “donation” block for Frances who has written a quilting book called “Birds in the Air.” I did get back 39 blocks, one being a donation block for Frances, which she has since received, but there were like 35 or so swappers (I forget how many) and so some of my blocks are done by the same quilter. I may add more blocks to what I have done already. This was easy block and a very fun swap! The local quilt show on pushed me to get some finishes beforehand. I had 7 quilts before the quilt retreat at the Creative Place without binding on them, in addition to 2 very mini hot-pad sized quilts. Most were trimmed down prior to the retreat, but a few were not. I also quilted & stitched down my challenge quilt for the guild show. I didn’t mind free motion on the quilt with everyone in the room with me. It was a nice topic of conversation, and several people commented on how they liked how unusual the quilt was. And boy it’s artsy. I personally don’t like the frayed edges on the solids. But I don’t do much raw edge applique. My other attempts at raw edge over needle turn are my Don’t Panic Quilt done in batiks (higher thread count), or a few other quilts where I had satin stitching on the edge. I think it may have been exacerbated by the fact these are “lower thread count” since they’re solids. Anywhoo, the birds in the air done, and the quilting on the challenge quilt done, means that duh,duh,duh, duhhhhh – binding was left on several, several quilts. Not large ones, thank goodness, but I do bindings a special way, and usually finish by hand. Luckily the focus provided at a quilting retreat leads to just that. I could get the fronts sewed down in the early morning before most people are awake, and then handsew later on, when everything is put away to pack up to leave. And I just loved seeing all these little lovelies. Together was a blast! This is pre join on one quilt that ended up going for charity quilt. It has a life and a story that I haven’t told, but even so, it went out to the charity quilts for something colorful for our guild show. It was a hard decision, but I think the right one to let this mini,mini quilt go. Did you realize how many of my quilts have the “hidden underneath”/kicker/flange binding on them? A LOT! And I love it since it gives off the extra little something needed to color frame the quilt. Like this one in yellow. This block was given as a paper piece practice from my guild for a name tag. I put the block into use by multiplying it (the original block was just one square) last summer I was going through bright scraps, and my only criteria was “make it bright and saturated in color” for chosing color. And small pieces are a plus here. Sadly enough, I donated this one too. I love this little guy, and hope it brightens up someone’s day just a little bit! I don’t think I individuallized the other bindings I was working on, but here’s the quilts ‘en mass’. Ok out of the 4 quilts you see here, 4 quilts have the kicker/flange on them. Clockwise from the top left, flange in: true deep blue (not turquoise), dark purple, dark coral, and bright pink. And this quilt was finished quilting (except for the very corners) a few years ago and just needed corners and binding. The binding was set aside special years ago. This one is a decent sized bigger than my other quilts, but even this is only like 3 feet on each side. I am sure I talked somewhere about my card trick quilt. No flange appropriate for the card trick quilt. But I thought about it. Briefly. No more individual ones at all. Luckily, I can spread out when most are still asleep. All these yummy quilts to bind. Mmmmm. Like a multilayered hero quilt sandwich with all the toppings available, all these stack up quite nicely in a small quilt stack! With only binding showing on most of them! I am thinking about it, and a couple of choices I would have changed the “outer binding” to be a little less wild if it wasn’t for the kicker to ground the quilt and the binding together. Like the yellow calms down the crazy purple/orange binding on the bright quilt, and the tie-dye nostalgia print has a dark purple to ground the binding in with the quilt and gives it just the right movement. Now if only I could be making these quilts bigger on the scale of 1:4 or so then maybe others would take these little quilts seriously. Or not, they’re fun quilts. I got the quilt made out of “purina” leftover blocks in this stack. Purina, like the logo of red & white checkerboard. For the dog food etc. I can’t ever not call the quilt that now. Quilt on the left below. I would like to recap my 2015 quilt related accomplishments. Many of them are tops, I really did little to no Free Motion Quilting during the year of 2015. I did have three quilts quilted during the year. Some of the blog posts I was about a month or two behind. Usually I am finding myself sewing or surfing with my extra time, or board game playing, or football watching, or video game playing, or playing solitaire on my phone, or chatting with ladies from 4 other quilting states at the big quilt show this year. You get the picture. Distractions abound. From the beginning of the year, I did spend a lot of my weekends quilting, even if they weren’t documented immediately afterwards. I will try to recap my quilt life 2015, using some familiar pictures, some new. I started off with the last round of the Twilter Round Robin quilt I was working on for Diane. I did the last bargello style border (green to blue waves). I drafted this from graph paper. I made more work for myself than I needed to because of the multilevel greens that I added. I completed the quilt top for fellow quilter (and also once “quilt” podcaster) who lost her husband suddenly in the fall of 2014. Looking back through my archives, I can’t believe that I forgot to blog about this quilt. It was meant as a nice surprise for Ruthann. She wanted something “green and sciencey”. I had seen this quilt in a book I got in 2014. I had emailed a bunch of other people in our group, most of which remembered Ruthann, but not all of them had. I had a list of the strip sizes I needed, and instead of the other people sending me “completed blocks” I asked if they could send strips and/or strip sets. I was amazed at what was sent on this quilt. And I did lots of extra work, cutting up and only using a portion of what was presewn for me just so I could have a lot of variation on the quilt. I completed the top in early January, and completed the finished quilt in May, after our meetup with Jackie from Sew Excited Quilts quilted this quilt (and one other) for me. I had overestimated the size of making 5 full DNA strips, so the last one became a “bed runner” which was quilted separately by me at home. In Feb, at the annual guild retreat, I finally finished my borders and my backing for my Royal Red King’s Puzzle quilt. In March, I translated the quilting pattern from my Dancing ribbons quilt to ceramics. I need to mount this. I also finished the borders on my weave quilt after figuring out how to do the ends. I brought a small quilt I had worked on a few years ago, a disappearing four patch quilt, to the lady who was quilting my Royal Red quilt. Sandy from Artfully Quilted did the honor for me for the red quilt, and also works on donation quilts for the local hospital. I was happy to donate my disappearing four patch, even though I was originally going to practice free motion quilting on it. I think sometime I worked on the back for the weave quilt, I didn’t finish it, but I got some pieces together for it. I usually piece my backings so I don’t buy the extra large fabrics that often. But it takes some time. April I made some things for the quilt show, in addition to another quilt block for another quilty podcaster. I also received my fantastic Round Robin quilt back and in the squeak of time, got arrangements for this quilt to be in the regional festival. I think I was on top of the world one minute of the day, and I was crying in disappointment the other part of the day. This quilt, didn’t almost make it into the show, and I am blessed that things either worked out for it to be there, or someone gave up a spot or something else happened to allow me to have the quilt in the show. Anyhow I can only take credit for the center, some of the fabrics, and the tiny outside border. May was the finish for the show, getting all these quilts ready with labels, sleeves, and everything prior to June. It was also time for me to get extra wound up for inviting some friends to Kansas City area. May I also met with Jackie for our (now annual sorta) sewing day at her studio! June was our regional quilt festival, and fantastic meetup with friends and with guildmates, seeing other friends’ quilts and making new friends. In July I finalized my “watermelon dresden” pattern for myself, and worked on getting my studio organized, and set myself up for the fall of scrappy quilts. August, I was getting myself organized and sewing all the 16 patches that eventually became my Arkansas Crossroads quilt. And getting more strings for the hashtag quilt swap. And I was starting to make shoo flys for the disappearing shoo fly quilt. I also took some time out to make a few small blocks for other small projects. These went to different quilts for different projects, but are both definitely “my” style. I made my hashtag blocks to be sent out to the twilter swap. And received some different ones in return. Then the end of the year I started sewing together all the scrappy pieces I was working on in the fall. I think I just blogged about unsewing and resewing my Winslow’s Corners quilt, which took up some of my November time. One weekend I looked at all the scraps I had left over from Ruthann’s quilt in the spring and put together a different top for picnicking. And on Thanksgiving day, got my Watermelon Dresden quilt layout figured out with actual fabric pieces I am working on. Currently I am in a “small battle” (with myself) as I ran out of the background fabric needed to make the quilt. The shop that sold it to me in November, I called, and they don’t have the same fabric anymore. I am working out how to do it since I started some of the border pieces already in one fabric. Actually, the quilt will have lots of background space due to how I set the border pieces. I figure there will be lots of room for background quilting on this quilt. And since I am writing this in January, I will hold off on my latest quilt block project. That is actually finished – for January anyway. Oh… and in April, just before all the mess for the quilt show started, I attempted to quilt my Samurai Sudoku quilt. But I was having a bad day, things weren’t lining up right. I haven’t yet told myself to rip out and start over on the quilting, but I almost have. I have been avoiding the longarm rental since I have to make a decision on this quilt that I will not like to make right now. I have been thinking and wondering if this quilt should be entered in more than just this show, in addition to the Kansas City Quilt Festival last June, and the local guild show. The quilt as I recall measures 80″ on each side and is very square. I haven’t thought of it as a two color quilt or a monochromatic quilt, but it really is. The center is a color-modified version of the Pattern King’s Puzzle, in which I changed the background colors to accommodate my amount of the middle fabric. I have always been partial to red and black color combination. The borders are completely my own design, using the 10 minute block technique, and the 5 minute block technique, paying particular attention to the fabric choices on the blocks. Then, in between fabrics, I introduced unfilled piping to create the thin black line running from 10 minute block to 10 minute block. This “glamour shot” was done at another quilting friend who did some quilting for me for two other quilts. This picture (below) was taken back in May before the quilt was bound before the Kansas City Regional Quilt Festival. My quilt didn’t win anything at the Quilt festival, and I heard one or two nice comments, in particular when I was picking up my quilt at the end and someone could see the quilt & the maker together. Judges comments were that they liked the dimensional elements to the quilt in particular – aka – the raised part of the 10 minute block, 5 minute block, and piping. I also had a few out of town/state friends come and look at my quilt in person during the show, which still means the world to me! After much uncertainty (of my schedule … see a story about Saturday schedule in previous post), I had Saturday to visit the show mostly free. The only thing for certain on my agenda was a Lecture done by Trisch Price about designing quilts in a series, and that wasn’t until the end of the show day. I was planning to treat myself to breakfast at a fancy breakfast place, but decided instead to go to Panera and of course a bird came begging along for some food (cheese bagel). After it was clear I wasn’t going to be needed, I sat down with fellow guild member Lois and we talked a little bit about family and living away from a place we grew up. Lois is our current guild secretary and does a fantastic job remembering / recording all the details during our meetings that I usually miss some. Both of us were worried the guild booth would not be staffed on Saturday, and both of us came early to make sure we weren’t needed to help setup/run the booth Saturday. Neither of us were needed, so we were free to enjoy the show. I stood in line for the show behind the lady with this T-shirt, which was ironic because I had a similar T-shirt on – same saying, different artwork/fonts. The T-shirt reads: “Never underestimate the power of a woman with a sewing machine”. I ordered mine online two weeks prior, and it showed up in the mail on the Friday of the show. Quilt magic was surrounding this whole entire show, I tell you. Anyway, I went right into the show and I decided I wanted to get pictures of all the quilts. All 700 quilts. As good as I can. And yes, I am going to try to do it on my new phone. The camera on this new phone has the same megapixels as my older camera in my “pockets of awesome”, but it seemed to work faster & easier than the regular point & shoot camera. I noticed all the other people starting at the front, heading slowly down the rows to the back. I had already been to the show the day before, so why not start at the back and head towards the front? I tried to do a systematic way for getting pictures of the quilts. I started back to front, each side of the show at a time. Then in the next side repeat the process of back to front. Also each section of the walls was like a “C” shape, so I tried NOT to move away from each C until I got at least some picture of each quilt in each section before moving to the next section. If people were standing in front of one quilt, I tried to get a picture of a different quilt. There were 3-10 quilts in each “C shaped” section. Arbitrary rules for my arbitrary completionist attitude. I do have to say I do a similar thing when I photograph quilts for our local quilt show. Very methodical and it gets at least one good picture of each quilt in the show for our posterity for the guild. Of course for our own guild, I bring a tripod to make sure the camera is steady and centered at the center of the quilt. But this is just for ME, not for everyone at the guild to enjoy. But this time, I was trying to SPEED through. Almost as fast as possible. AS I was going, I was trying not to blur everything, not necessarily document EVERY quilt maker too, but one shot, one idea of each quilt at a time. The back to front technique was a great idea. I had also read taking pictures in the morning was the best time. And I had witnessed that to be true during our local guild-only show. But for this show, probably the best time would have been like 3 in the afternoon. It was way less crowded than right away in the morning. The picture above shows traffic at 3PM on Sunday, almost dead compared to early Saturday morning. I joked around with people that back to front was awesome because I could go picture/picture/picture for a long time, and then “thump” hit the wave of people coming towards the back. Today they all had pieces of paper with them and a pencil too. So they were slower, and more methodically going through the quilts. I liked dashing to the back quickly as if I had someplace to be. The two halves of the show were organized completely differently. It was almost as if there were 2 shows together in one – three if you count the Beatles exhibit. The guild quilts were organized by guild. We had no restrictions on how many of each category of quilt would be entered with the guild, as they were not necessarily going for judging. Which means we had hand quilted quilts next to machine quilted quilts next to innovative quilts, and applique quilts. The different colors of hanging papers signified the different categories of the quilts. 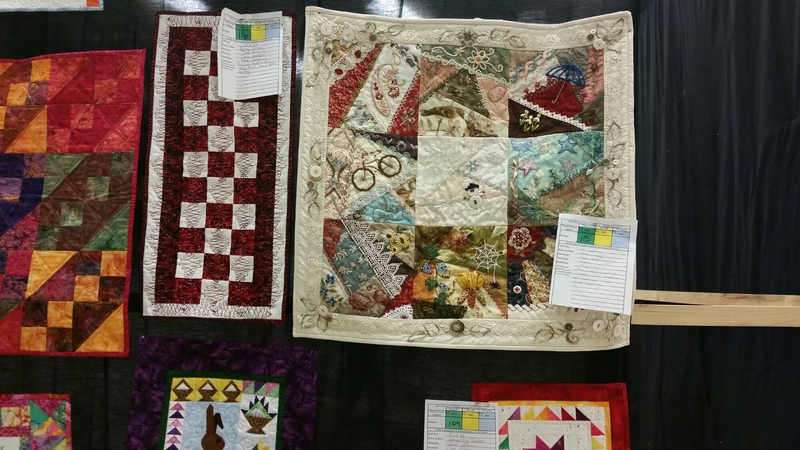 As you may be able to see in the picture above, one of the local guild names on the top right, a quilt with a blue tag, and then on the far left a yellow tag which would be next to the quilt next to it. These two quilts were in the same guild, Kaw Valley Quilters Guild, but not the same type of quilts. I liked how this showed & felt like community. The book lists all the names of all the quilts by Guild for the guild side of the show. Guilds first, then quilters. My speed method of taking pictures did have its downside. I have plenty of pictures that are blurry. Which is too bad I couldn’t settle myself down enough to take a good picture. I think it was how I was going close to some quilts, and then far for the next quilts. The camera probably couldn’t figure out what focus to use and I am sure if I wasn’t “fighting against time” I could have slowed down a little bit more. There were 700 quilts to photograph if I wanted them all. And we had planned to do lunch with the twilters, and I wanted my picture with twilters in front of Twilters Entwined quilt, and I hadn’t seen the vendors, and I hadn’t seen the Beatles quilts, and I had the lecture, and Sunday I was going to be volunteering. So I SPED through the quilts. Too bad. I missed out on some great pictures. I did get some pictures of hanging cards next to the quilts. Looking over them in detail this weekend I figured out something. If I really liked a quilt at the “gut level”, I took a second picture of the tag. Sometimes the tags were blurry. Sometimes they were fine. Good thing I had the guild book to help me decipher names here. I am going to post these as a gallery, something I don’t often do. It seems if you click on one, it takes you through the gallery at more full size. Let me know if this feature has issues. It seems to work on my computer when I test it. About 30 pictures of quilts with names of artists attached. Between the month of January & February, I was frantically running around trying to finish the very last Round Robin quilt I did for my #twilter group A. At the time of this writing, I still have not received my own round robin back, but I hear it’s coming, delayed by fabric selection. Anyway, I had looked at an idea on Pinterest while searching for something else, and this border idea kept sticking to me as a great way to finish off a quilt. First, the picture of the end, then we’ll discuss the process. The idea I had seen was a strip style quilt with white borders, an accent color, and then multicolor strips outside extending to the end. I had punched this into EQ7 and no matter what I saw there, I just couldn’t decide that they were any better than the strip idea I had seen on pinterest. This was the quilt as I had received it. It was so lovely pinned to my design wall (it was heavy, needed pins to help keep it up there). The whole quilt was so whimiscal & fun. It needed a whimsical & fun last border on it. Anyway, I had been doing bargello quilting for a while, my Royal Red King’s Puzzle quilt is a bargello style, and so was another quilt I was working on (not shown yet), and so my mind was doing strips anyway. Lucky me, the math worked out fantastically and I could make 12 inch blocks. So I drew it up in my sketchbook, abandoning all these EQ7 variations I had done during Nov-Jan. I can divide easy numbers easily, and I first was thinking I would do a plain inner border and maybe inset some applique swirls on it, which would have also have been really nice too. But then I started laying out fabric for it, and I found I had a really nice light green that looked like a good compliment to Daisy’s white & green disappearing four patch round. I was thinking the green was like the grass for the birds, Daisy’s round was like a white picket fence, and then I decided to do a pathway & some sky, using the pathway as the contrasting color. The pathway & the blue sky border are actually pieces I purchased for Laura’s neutral round robin that didn’t exactly “go” with her quilt, but were close. Well the pathway I bought & the light blue/grey that I used that I bought were for her quilt, and then I tacked on the bright blue butterflies to the order for ME, but they looked really good next to the blues in the birdhouse round. So decisions I thought I was making wrong earlier, ended up being good decisions now. And then I decided to change the green fabric. Why? Because the green fabric I originally picked (not shown) was a lower quality. I could tell. It would have worked well for me, but not for a friend. It was perfect though in shade & lightness. So I had to substitute. Which lead me to the lightest seafoam green fabric I have in the quilt. But the fabric was “too plain” by itself. It was a good shade of green, the closest to what I was searching for, but it was too plain by itself. But then I also saw the next lightest green at the fabric shop that mirrored Daisy’s fabric just exceptionally, even though it was darker than I wanted. I decided to do both in the quilt and then just layer them next to each other. THEN I had the even darker batik sitting next to my computer. And as the week went on, it kept taunting me, telling me to gradate the greens into 3 levels of dark. Which I did! And I love it. And as you can see from the picture above, I had a fairly easy time of making the blocks once they were figured out. Each half was only 7 strips of varying widths. Strips of green & strips of blue & brown. The blue & brown I made easy and made a base unit, then tacked on the extra blue to the base unit for the different lengths of the strips. The greens I had less of a defined base unit, but that was ok.
Bargellos are a lot of work, don’t get me wrong, but there is an ease to them. You sew the strips into sets (base units) and then cut up those sets to the widths you need. The hard part is going back to the ironing board for all these seams. And here I could see it was going to work! The corners were actually the trickiest part, trying to decide the order I would quilt them in. Part of it is like a log cabin block, and part is strips. I snuck in the focus fabric into the little part of the border in addition to some of my pretty pink fabric as a nice compliment. My only regret is not bringing in some of the cream into the quilt. I love it, but I think cream sitting right next to the pathway fabric would have eased some of the green we see here. I calculated about 2000 pieces in total for the entire round of the quilt. Not to brag, again, bargello easily lends itself to having lots of pieces with less individual sewing sections in it. That did lead me a few thoughts about my quilting insecurities. 1) Did I go overboard? 2000 is a lot of pieces. 2) Did my sections of the quilt overshadow the other sections of the quilt. 3) Did I try to show off? I had the realization that not only did I do my best job for a quilt for a friend, but I did a style of quilt that was pleasing to me in a style that I was comfortable doing, something that I was familiar with, and also shows my style enough for others to know just by looking at it that border was mine. I did my best to match the other’s sections, and perhaps there is a little bit of overboardness, but even though it took a lot of 2 full days of 2 full weekends, it meant a lot to me to make something that I am proud of that can go to my friend Diane, who had to put up with all my insecurities with the Round Robins along the way. And with that, I am done with my section of the Round Robin quilts. Once I receive mine, I will see what pictures are in the flickr group and put together a roundup for the round robin in its own post. I hear mine is outstanding, I can’t wait to see it. You are currently browsing the archives for the Quilting Finishes category.